With music streaming edging ahead of digital downloads, vinyl records and CDs in sales, music listeners want pretty much everything on demand, on any device for a monthly outlay. As more and more listeners shy away from physical recording and digital downloads, music streaming services keep popping up from different places and sites, each one of them offering a set of quirks and songs. If you want to give music streaming a try or you just want to contemplate moving from one service to another, here are the top five music streaming options. Amazon Unlimited Music and Prime Music are easy to use, on-demand services and ad free. Although they both are from the same company, Prime Music is free to Amazon Prime members, but non-members are required to pay $$ per year. For Amazon Unlimited Music or a Prime member needs to pay $8/month or $80/year or $10/month for non-members. Even though both services give you a wide selection of music. Amazon Unlimited Music features tens of millions of songs, that you can listen to anywhere, anytime on all devices including, tablet, smartphones, PC, and Mac. You can also get to listen to music on an Alexa-enabled device like Amazon Echo and other. With Prime Music, you get 2 million songs that you can listen using any device. Both services have great functionality and feature that include the ability to download and listen to files offline. Spotify is one of the best music streaming platforms you’ll ever find. You can test it for free for a month before you start paying for the monthly cost. Everyone can use Spotify, including new musical explorers and streaming newcomers. There are a number of reasons that make Spotify among the best music streaming services. The service is extremely well-maintained, with user-friendly interface on iOS, Android, desktop and other third-party integrations such as Google Cast and Amazon’s Alexa. Spotify also has a diverse array of music-discovery vehicles and well-curated playlist. With a library of over 35 million songs that can be accessed via most digital platforms, Spotify is a great place to find favorite artists, enjoy exclusive live sessions, create and share playlists. You also get better sound quality if you are using the paid services that cost $10/month ad-free. If you are looking for versatile services with a large catalog of titles, Spotify is the place for you. Are you an Apple die hard user looking to integrate to the best services with all your stuff, you should subscribe to Apple Music. While people prefer Spotify to Apple music, when it comes to usability and features, Apple music is better than Spotify. There are also some compelling reasons why you should check out Apple music. First and foremost, Apple Music is Mac OS and iOS integrated. Apple Music is available on Android and iOS devices and has over 40 million titles available. This makes it the best choice for travelers. Apple music lets you download music to fill seemingly endless hours when you are on the move. It also offers exclusive contact from an artist, Apple radio, Beats 1 radio as well as Siri’s voice command. For iTunes lovers, they can play music uploaded from your personal library using its iTunes match. Pandora is like having your personal DJ. With Pandora, you can listen to your favorite artist and discover new music by just telling it the name of the artist you want to hear and it creates a channel. The channel created comes with a selection of music from the artist and from other artists who use similar styles. With over 40 million titles, Pandora is the best way to be introduced to new music and new artists. Pandora has expanded their services to include an on-demand option that you pay for $19/per month. Tidal offer one-month free trial and $10/month or $20/ month for HiFi with access to Hi-Res audio, for those who refuse to compromise when it comes to audio quality. Tidal has files that offer Hi-Res Audio sound and CD-quality services. It’s services include 40 million songs and 130,000 videos and HD music videos. It also includes an excellent app that is compatible with Denon, Sonos and other speaker models. Tidal seems to be aimed towards the mass market. But it’s best for people who care more about the fidelity of audio source,than library size and usability. For audiophiles, Tidal is the best. 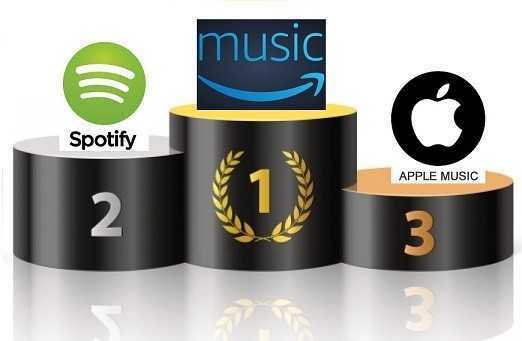 There you have it, the Top 5 Music Streaming Services of 2018. Even if digital music downloads and physical CDs are on the decline, trust these five music streaming services to keep you entertained everywhere you go. 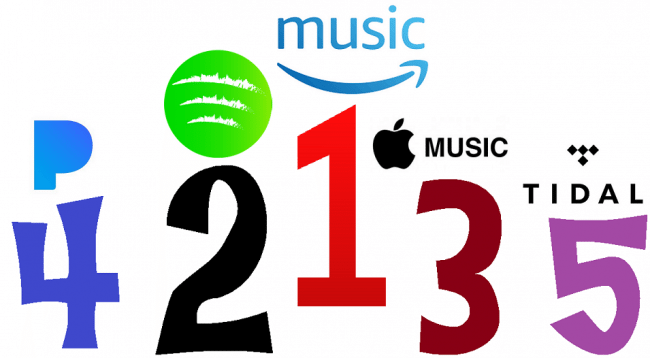 Streaming services let you stream music and even downloaded to listen offline for a small monthly or yearly fee. Feel free to try the service as they offer a free 1-month trial.